Select the variables that you want to measure. When selecting a temperature logger, choose one with a range that is closest to the typical temperatures in your application. 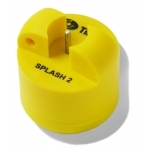 The Splash 2 is a waterproof data logger designed for high temperature applications where a fast response is needed. It is used for monitoring washer disinfectors, industrial dishwashers and other cleaning processes, typically in hospitals, catering establishments and industrial premises.